The Tower of Mirages randomly generates levels once players reach it via the new Ultimate difficulty. Atlus has a cure for all of you out there plagued with too much free time during the holidays. 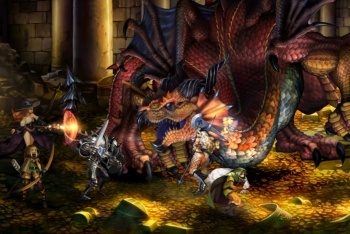 Today, they released their latest patch for PS3 and Vita brawler Dragon's Crown which not only adds a new difficulty level and increased level cap but also a dungeon, The Tower of Mirages, capable of creating tens of thousands of randomly-generated levels. To make sure characters are up to the challenge, they can now go from level 99 to 255. The Tower is unlocked via the new Ultimate difficulty, which players can access from the Temple once they beat the ninth layer of the Labyrinth of Chaos. Atlus' PR Manager, Josh Hardin, got pretty enthusiastic over the new feature when it was announced on the PlayStation Blog. "It's randomly generated and it has tens of thousands of levels. TENS. OF. THOUSANDS. I say this with all sincerity, since I know some of you are going to try to KO it: 'Good luck,'" he wrote. The latest patch also makes it easier to make alternate characters. Once a player has a save file that's cleared the story mode, they can make a new character that skips ahead to the game's Talisman collection quest. The patch also includes the expected set of tweaks to gameplay stability, character skills, controls and NPCs.